I doubted the sauce in this recipe when I saw the ingredients and even after I made it I doubted it but once it is mixed into the noodles you will be surprised that you cannot really taste the HP sauce! You could just buy some Yakisoba sauce from the asian supermarket though to make it easier if you like. 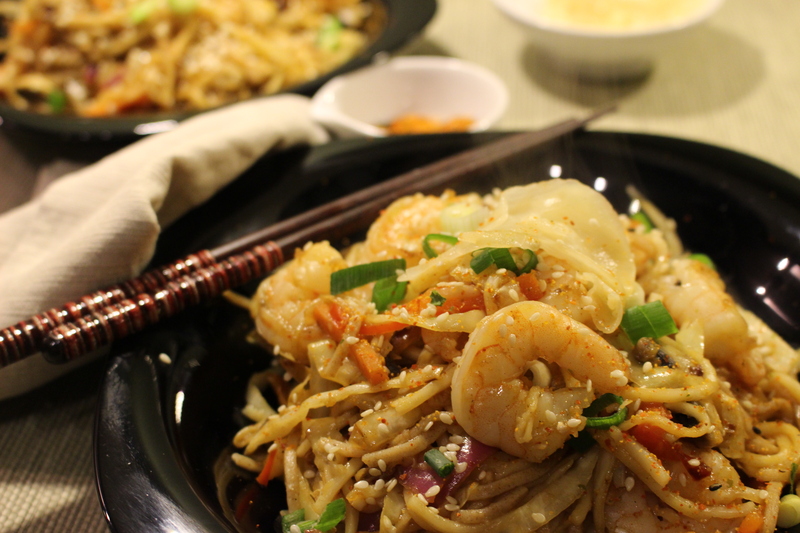 2 packs of soft noodles – straight to wok. 1 tbsp soft brown sugar. Mix all the sauce ingredients together in a jug and set aside. Heat the oil in a wok and put on a medium to high heat and stir fry the carrot, red pepper,oonions, garlic ginger and cabbage for 2 minutes then add the mushrooms and fry for a further 2 minutes. In a seperate frying pan add a little oil and fry the prawns until pink. Add the noodles to the vegetable mix and add a tablespoon of sesame oil and fry until soft. Add the prawns back in and add the sauce a tablespoon at a time, checking as you go to see if it is enough and cook until everything is hot. You dont want to overpower the noodles with the sauce. Serve in a bowl topped with the spring onions, sesame seeds and pickled ginger. I added a drizzle of chilli oil and some nanami togarashi to my bowl for a bit of spice! just like at wagamama!